The story of young Krishna was first told more than 2000 years ago. Originally recited by bards from memory, it was later composed in the Sanskrit poem, the Harivamsa. The sun-like baby Krishna, Vishnu come to earth, was the delight of Vraja. Born of this earth, reared in the soil of Vraja, yielding to the temptations of this world, indulgent, inimitable, lovable in his pranks, ever guilty, yet redeemed, he was extremely fond of butter and butter milk. The cowherdess would churn butter at the crack of dawn, keep it safe before going out to tend to cattle or settle down to domestic chores. For Krishna, no amount of safekeeping would work; he would lay his hands on butter, by hook or by crook  most of the times by the latter. 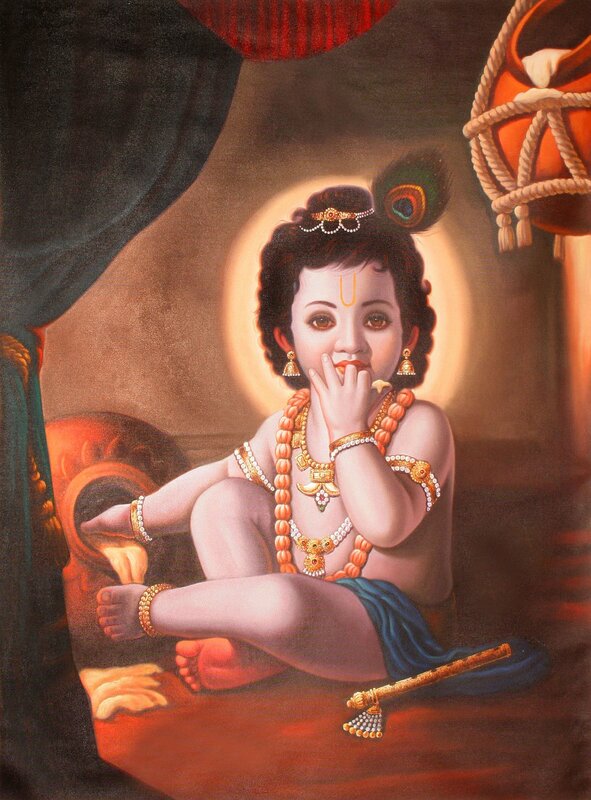 Baby Krishna looks irresistibly appealing  a blue complexion soft like the monsoon cloud, shining locks of black hair framing the most adorable face, knotted up to curtail those curls, tied and a peacock feather tucked in. With large lotus like eyes, he looks innocent while licking the butter off his fingers. His mother Yashoda has lovingly adorned her baby with a lot of jewellery. If heavy drapes fall on the left, on the right hangs a chorded basket holding the urn in which the butter was purportedly kept safely. Krishna seems to have pulled down one urn and in his greed to consume as much as possible, he has spilled some on the floor as well. On the other side of baby Krishna lies his inseparable flute. A divinely adorable painting to touch not only Vaishnavite hearts but pull at all heart strings.